Public Folders may look like normal folders of the mailbox but instead of being privately saved, they are in an area where they are liable to be shared within the organization. Any kind of data; be it emails, calendars, contacts etc can be shared and is protected by permission to access or modify them. The concept of public folders was introduced in Exchange Server in the year 1996 and since then they have been a great help to the users for sharing knowledge and information within an organization in a secured way. Back in Exchange 2007, it was estimated that public folders will not be a part of later editions as they require separate management and replication service. However, ignoring these rumors, Microsoft introduced public folders in Exchange 2013 but with different architecture and named them Modern Public Folders. In Exchange 2013, public folders get saved into special type of mailboxes called public folder mailbox and they are treated as the user mailbox. This made backing up, troubleshooting, and replicating public folders relatively an easier job for users. Generally, IT admins get the advantage if the employees prefer to use OWA over Outlook® as they get free from the job of installing, maintaining, and most importantly troubleshooting Outlook related issues across the organization. The main reason why OWA is preferred nowadays is users get the mobile access to the mailbox database from public network. With updated Exchange® version, OWA improves and same is in the case of OWA 2013. However, with few improvements, there are some options and facilities that can be accessed differently. 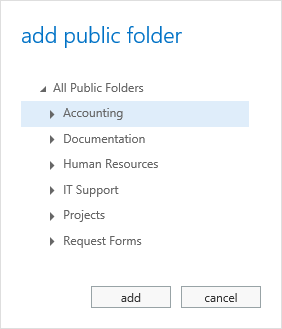 For example: Adding public folders in OWA. "I have been shifted to new department and my mailbox is moved to Exchange 2013 server. Now, Outlook Web App is completely new to me. In the older edition, I could access public folders through a link at bottom-left but I cannot find this link in OWA 2013. There have been some change in the public folder architecture in Exchange 2013 but I know they exist. How can I access public folders in OWA 2013?" In Outlook Web Access 2013, users can access PF but there is a twist. Public folders cannot be added simply as in previous OWA editions. There are some changes as well as limitations. Step2: Now, select 'Add Public Folder' from the pop-up menu. Step3: You will see all public folders or only those that have been root for you. Select the folder that you wish to view and click 'Add' button. Step4: The selected folder will get added to the Favorites section and will help to access the public folders through it. However, folder sorting can be done through simple drag-drop procedure. 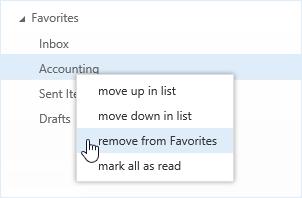 In order to remove the added public folder from Favorites; right-click on the folder and choose 'Remove from Favorites'. Only mail folders can be added to the Favorites. Other items like calendars, contacts, or tasks cannot be viewed even if they are a part of public folders. 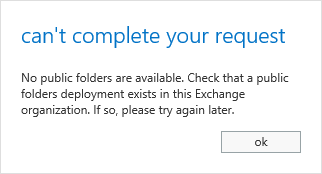 If the mailbox is moved to Exchange 2013, then make sure that same is done with the public folders also. If the public folder of the organization is still hosted on lower Exchange editions, you will be restricted to access public folders. Note: OWA gives access to the mailbox and public folders from a public network but there are a number of limitations defined on overall data accessibility. 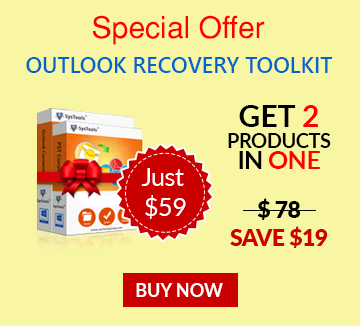 For complete public folders access, it is recommended to connect with MS Outlook.